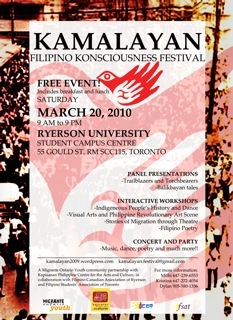 There's a wonderful event called Kamalayan happening on March 20, 2010. The special all day cultural celebration features panel presentations, Philippine history and culture, migration studies, dance, poetry, and visual arts, and a closing concert party. The event will be held at Ryerson University's Student Campus Centre on 55 Gould Street, RM SCC115 in downtown Toronto. The event starts at 9 AM and ends at 9 PM. And yes, the entire event is free! Presented by Migrante Ontario Youth in community partnership with Kapisanan Philippine Centre for Arts & Culture, and in collaboration with the Filipino Canadian Association of Ryerson (FCAR) and the Filipino Students' Association of Toronto (FSAT).